My little guy loves chicken and rice. It's safe to say that it is a clear favorite of his, possibly because he can get a little bit of all the flavors and textures in one spoonful. I happen to like it because it's an easy one pot meal which makes prep and clean up a breeze. 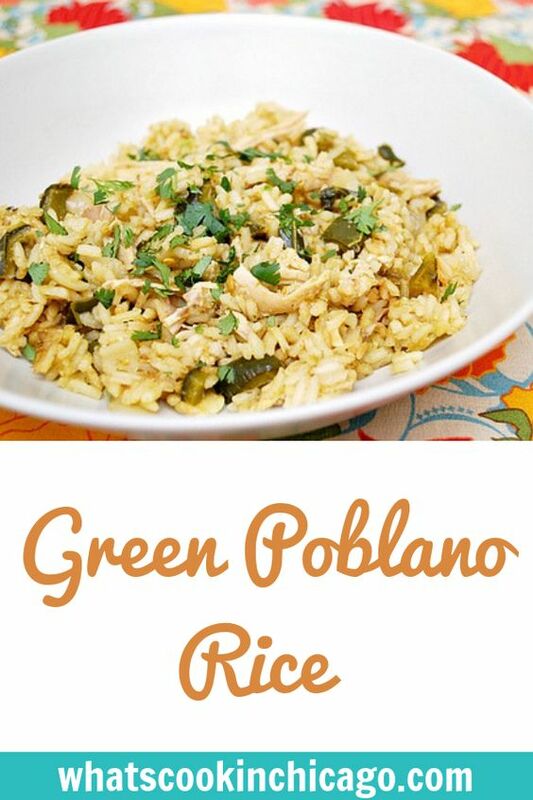 This particular recipe comes from Rick Bayless but I found it Epicurious. There are 3 major steps in this recipe - creating the chile broth, toasting the rice and cooking the rice on the stovetop. A bonus is that this dish can be made in advance and that allows for the flavors to fully absorb into the rice even more. You can make this vegetarian by omitting the chicken... and it's just as delicious with shredded or chopped roasted pork! The flavoring: In a 2-quart saucepan, combine the broth and 3/4 of the chiles, bring to a boil, then partially cover and simmer gently over medium to medium-low heat for about 10 minutes, until the chiles are very soft. Pour the chile mixture into a food processor, add the cilantro (stems and all), and process to a smooth puree. Press through a medium-mesh strainer into a bowl and stir in the salt. The rice: Wipe the pan clean, add the oil and heat over medium. Add the rice, onion, and remaining chopped chiles and cook, stirring regularly, until the rice is chalky looking and the onion is soft, about 5 minutes. Stir in the garlic and cook a minute longer. Add the warm (or reheated) chile liquid to the hot rice pan, stir once, scrape down any rice kernels clinging to the side of the pan, cover, and cook over medium-low heat for 15 minutes. Uncover and check a grain of rice: It should be nearly cooked through. 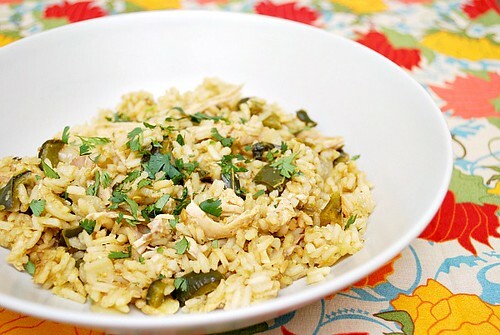 If the rice is just about ready, add the shredded chicken, turn off the heat, re-cover and let stand for 5 to 10 minutes longer to complete the cooking. If the rice seems far from done, continue cooking for 5 minutes or so, retest, then turn off the heat and let stand a few minutes longer. Fluff with a fork, scoop into a warm serving dish, decorate with cilantro sprigs and it's ready to serve. Loving this recipe. I am always buying those rotisserie chickens and adding this to my list of things to do with them! I made this tonight and had to tell you right away how delicious it was! I used it as a side dish so left out the chicken (Chicken was in our burritos. I was also cooking at a relatives house who did not own any sort of blender, so I just diced everything smaller and left it as was. Everyone raved over it!